« The Barry Smith interview: what is the nature of wine perception, and is wine flavour objective? 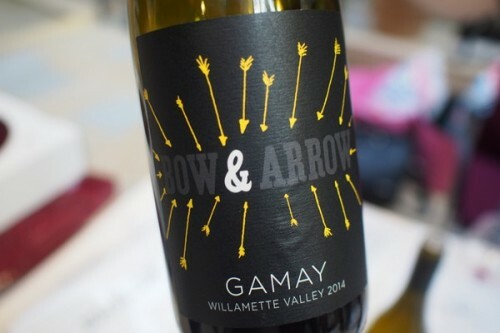 Bow & Arrow is a relatively new Oregon winery. It’s located in Portland where Scott and Dana Frank, the people behind it, work in the wine business. These urban wineries are pretty cool, I reckon. They bring wine to the city: who says that wine has to be made out in a rural location? There are no quality implications about trucking grapes into town, if you take some basic precautions. Scott and Dana are focusing on Loire varieties: the other wine I tried of theirs is a brilliant Cabernet Sauvignon/Cabernet Franc blend. But here I wanted to talk about their Gamay, because it’s a grape I’m really into at the moment. This wine is inexpensive (US retail just over $20), and it’s now being brought into the UK by Les Caves de Pyrene. Try the Edmunds St John Bone Joly Gamay from the Sierra Foothills. ESJ can do no wrong in my book!